The Nelsonville Public Library has a friendly, knowledgeable staff able to help you find a good book to read, answer a reference question, or to just get to know the area. Nelsonville library is the main branch of the Athens County Public Library system and houses the administrative offices and the cataloging department. The library provides public library services to the city of Nelsonville, Hocking College and the surrounding communities. The Nelsonville Public Library plays an active role in the community and partners with many local organizations, including the Nelsonville Area Chamber of Commerce, Stuart’s Opera House, and Nelsonville-York Schools. The library participates in the annual Parade of the Hills festival. The library also organizes its own programs, including weekly storytimes, Summer at the Library, and a number of adult and young adult programs. 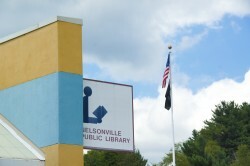 Civic leaders in Nelsonville founded Nelsonville Public Library on July 5, 1935 as a school district library. The books were borrowed from the state; a room was borrowed from Central School; and, a librarian was borrowed through the Works Progress Administration (WPA). Today the Athens County Public Libraries continue as a school-sponsored public library system. Though library funding comes almost entirely from the state, library board members are still appointed by the Nelsonville-York School Board. The Nelsonville branch has had many homes since 1935, including a storefront in the historic Stuarts Opera House building on the Public Square. When the Opera House burned in 1980, the collection survived but with substantial water damage. The fire necessitated a move to our current building at 95 W. Washington Street. Besides the normal offerings of books, magazines and newspapers, books, music, DVDs and videos, and public computers with Internet access, the Nelsonville branch offers an extensive Local History/Genealogy Collection (with a local historian on staff), rotating Art in the Library displays, and a Homework Help tutoring program.